Leading Manufacturer of anti collision sensor, radio remote control system, electro hydraulic thruster brake, industrial ac drive, safe track crane busbar and pendant station from Chennai. 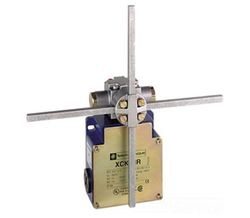 We offer our clients a wide collection of Crane Anti Collision Sensor that is is used as safety device to avoid the collision of two electric traveling cranes working on the same rails. Our offered device consists of a relay contact that is used to stop the long travel motion of the crane to avoid the collision between two cranes, which is sourced from the trust able vendors of the industry to ensure reliability and durability. Apart from this, we offer these crane anti collision devices in different specifications as per the demands of the clients. With years of experience and knowledge in this field, we are engaged in offering an excellent array of Radio Remote Control System that is mainly used in EOT Cranes, Hoists and other material handling equipments. 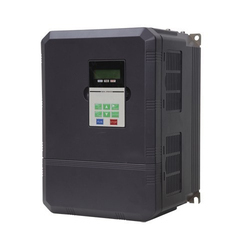 Provided radio remote control is manufactured using high grade components and progressive technology. We offer this radio remote control after examining it on various quality parameters. 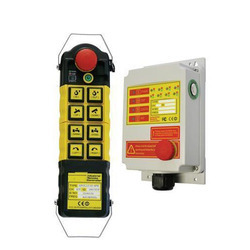 Available in various designs and specification, this radio remote control is offered at industry leading prices. Electro Hydraulic Thruster Brake is a device to retard the speed of moving machinery and to stop it accurately to the desired position. The braking force is applied to the brake shoes by a pre-stressed compression spring. The shoes press on the rotating brake drum retarding its speed, and finally stopping it. 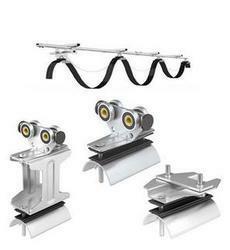 The releasing of the brake and compressing of the spring is done by thruster. Brakes, Brake shoes, Brake shoe with lining and brake lining are supplied to suit various make of cranes such as Amsak cranes, Apex cranes, Atlas cranes, Avon hoist, Electromech cranes, Esquare cranes, Grip cranes, INDEF cranes, Intelle cranes, K2 cranes, Kone cranes, MM engineers cranes, Krans Cranes, Magna cranes, NE cranes, SL cranes, Sri Pranav cranes, Sun cranes, TAK cranes, Unitech, Viralishanmuga cranes, WMI cranes, etc. Also, Brake, Brake shoes, Brake shoe with lining for various make brakes such as PETHE, Speed-O-Controls, Speed-N-Systems, Strom kraft, Electromag, Crane control equipments, Sterlin Controls, Top Enterprises, Speedage Controls are supplied. Brakes shoe with lining is supplied to suit as per drum diameter/models of brakes for Thrustor brakes, Electromagnetic shoe type brakes, Drum brakes and Solenoid operated brakes. Brake shoes are supplied to suit drum diameter ranging from 100mm, 150mm, 160mm, 200mm, 250mm, 300mm, 400mm, 500mm and 600mm. Brake shoe shaft/Brake Pin is also supplied on request. 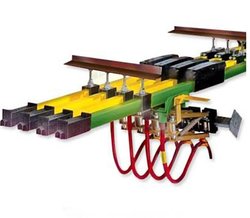 Our valued customers can purchase from us an extensive assortment of Safe Track Crane Busbar. That is used for multitude of power supply applications such as EOT cranes, monorail hoists for straight/curved path, transfer cars, electric trolleys, bus trunking and amusement parks. These safetrack DSL shrouded bars are manufactured by highly skilled professionals by taking optimum quality materials, according to the industry accepted models. Conductors can be mounted side by side. All other orders are custom. To meet customer needs, we have enhanced performance while offering more standardized models. The track wheel is now made of carbon steel, making it sturdier and longer-lasting. Products are primer-coated, which allows customers to choose the desired top coat color. 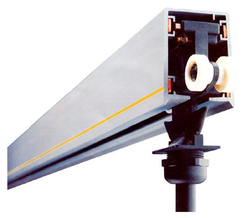 Punch-mark on end carriages for easy centering and drilling for girders. Electromagnetic disc type spring loaded ac fail safe brake is supplied for replacement in various make of hoists/ crane such as sigma hoist, morris hoist, rope master hoist, avon hoist, tak hoist / crane, sun crane, indef, amsak crane, viralishanmuga crane, apex crane, intelle crane, sri pranav crane, unitech, magna crane, electromech crane, atlas crane, grip crane, krans crane, esquare crane, sl crane, shrusti, sriram engineers, asian crane, jaico crane, ankit crane, armsel crane, reva crane, saico crane, garlick crane, shrushti crane, tak crane/hoists. Electromagnetic disc type spring loaded ac fail safe brake model: dat-130, dat-140, dat-150, dat-150x, dat-190, dat-190x, dat-235, dat-235x, dat-290, dat-290x, dat-290xx, _dmt-15, _dmt-20, _dmt-30, _dmt-32x. And _dmt-45. Spare brake coil and brake (friction) plate with lining having square bore and geared bore is also supplied with quick delivery. dat series brakes are supplied with plain square (driving) hub & without drill to mounting plate. bore & length of driving square hub should be machined as per requirement. dat series brakes are supplied with geared hub on request. in dat- 130, 140 , 150 , 150x, _dmt-15 brake shaft is not passing through brake. Cable Festoon System are used to electrify various types of mobile equipment. They can be designed not only to support and protect flat and round electrical cables, but air and water hoses as well. Festoon systems are typically used on overhead cranes, port cranes, refuse cranes and other material handling applications. This system also used for Electrification of Moving Machineries. Compact, reliable and secure power supply system for cranes, hoists, trolleys, automated warehouses, etc. Worldwide installations applied both inside and outside, high and low temperatures and under extreme (weather) conditions. The unique double-sided flexible rubber seal provides protection against dust, damp and corrosive environments.